After an idyllic day on Monday and challenging conditions yesterday at the Amlin International Moth Regatta, today brought yet another set of conditions to the regatta hosted by the Royal Bermuda Yacht Club with racing canned due to light winds. PRO David Campbell-James got Race 6 underway on schedule at 11:00. Irishman Rory Fitzpatrick aced a port-tack start on his foils and rounded the windward mark in the lead, but the race was abandoned about halfway through when the wind died away to 5 knots or less. No other racing was conducted as Great Sound became glassed over, inhibiting the sailors from getting on their hydrofoils. “The fleet was foiling off the start line in winds around 10 knots. After about 35 minutes of racing we had only 22 boats complete one lap, so we made the decision to abandon the race and postpone for the day,” said Campbell-James. “Tomorrow’s forecast looks to be windy again and Friday looks very good so we’re hoping that we’ll get at least another five races before the end of the week, which would give everyone a second discard." 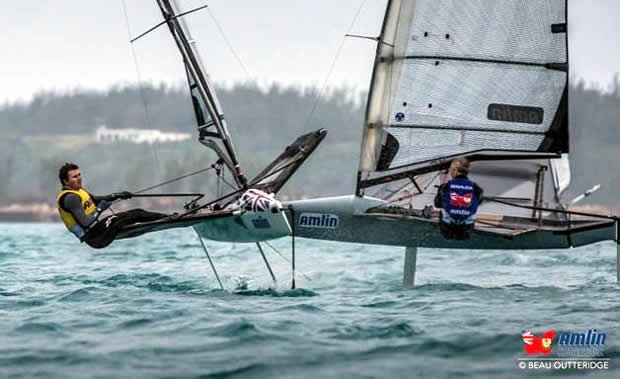 The Amlin International Moth Regatta is sponsored by Amlin plc, a FTSE 250-listed independent global insurer and reinsurer with operations in the Lloyd’s, UK, continental European and Bermudian markets. Additional sponsors include the Bermuda Tourism Authority, EFG International, Gosling’s, the Official Rum of the Regatta, and Kaenon Polarized. Superb new IRC boat from Judel-Vrolijk and Hakes Marine. Contact joff@whitecapltd.com for more info.